Nowadays sneakers are very popular and commonly used product. And you can create a profitable business if you decide to start sneaker online store. 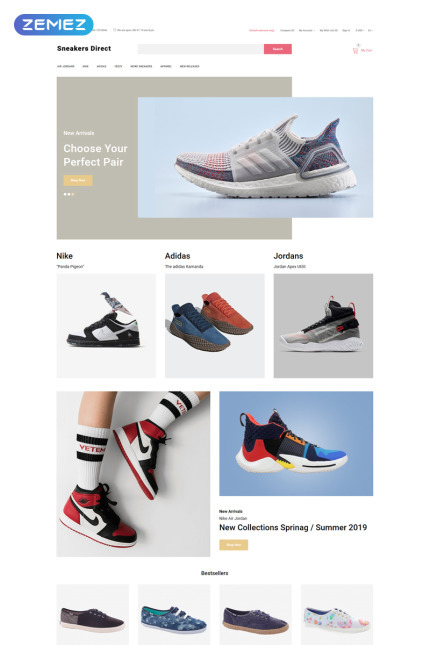 Though it was developed for sneakers shops, you can also use this Opencart template to provide customers with various types of products and footwear. Sneakers Direct was developed by a team of professional designers and allow you to highlight images and most important information. It also has pre-built pages for different types of products and you can fill them with content or products. You can edit design and structure with simple drag and drop. You can also use a blog and social options to advertise yourself and promote products. It has full e-commerce Opencart pack and works perfectly as an online store. It suits sneakers shops, fashion stores, beauty items stores, footwear shops and many other types of online stores. All OpenCart templates can be used with Australian dollars just follow this video tutorial on how to change the currency default, select Australian Dollars and currency code AUD.